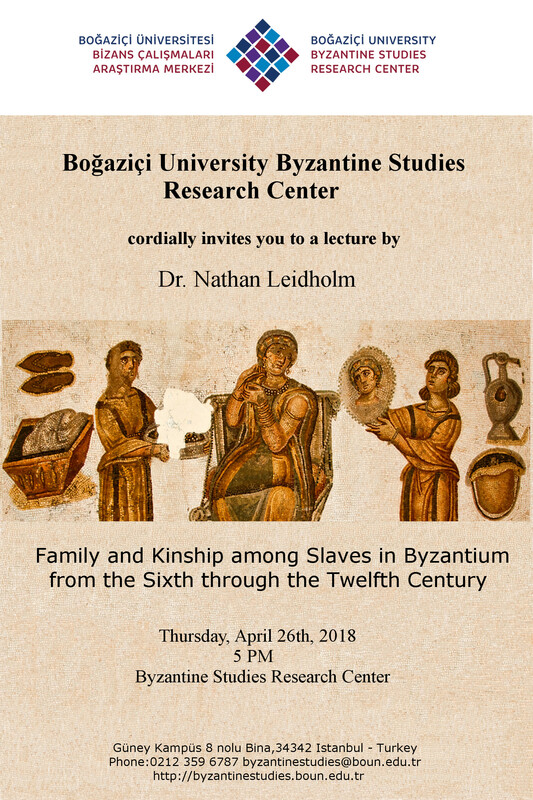 Dr. Nathan Leidholm'un "Family and Kinship among Slaves in Byzantium in the Sixth through the Twelfth Century" başlıklı konuşması, 26 Nisan 2018 Perşembe günü saat 17:00'da 30 kişinin katılımıyla Bizans Çalışmaları Araştırma Merkezi'nde gerçekleştirilmiştir. Traditionally, slavery in Rome has been linked to the empire’s expansion, with prisoners of war supposedly making up the bulk of Rome’s supply of slave labor. In fact, scholars now recognize that the vast majority of this labor came from natural reproduction within the existing unfree population. This was equally true for the Byzantine period. While overcoming immense legal and social obstacles, Byzantine slaves managed to marry (often extra-legally), have children, and even, at times, to maintain some semblance of family life despite their servile status. Slave owners were encouraged to maintain the integrity of these slave families, and situations arising out of the marriage or coupling of slaves from two different owners were even covered by the law. At the same time, slaves could and did become integral members of their masters’ households and maintained such ties with their former masters’ families even after they had gained their freedom. Regardless of their legal standing, there is clear evidence that slaves and freedmen played an important role in Byzantine family life that extended far beyond issues of economic production or status symbols for wealthy slave owners. Drawing from a wide range of written and material sources, this presentation examines the ways in which slaves in Byzantine society from the sixth through the twelfth century were able to form and maintain bonds of kinship and to live as families, in various forms, and how such ties were represented in Byzantine literature, theology, and law. The presentation itself is based upon a larger project, which aims to analyze the norms and realities of Byzantine slavery with a particular focus on social relations and cultural attitudes surrounding the family. In doing so, it also explores notions of family and kinship in their social and cultural contexts, including the varying definitions of the family and the dynamics of power and affection that shaped it. Nathan Leidholm earned his PhD in Byzantine History from the University of Chicago in June 2016. He previously received a BA in Classics from the University of North Dakota in 2008, and an MA in History from the University of Chicago in 2009. His dissertation, "Political Families in Byzantium: The Social and Cultural Significance of the Genos as Kin Group, ca. 900–1150," explores the role and function of the Byzantine aristocratic family group, or genos, as a distinct social entity, particularly its political and cultural role. A revised version of the dissertation will be published as a monograph next year with the title The Form and Formation of Elite Byzantine Kinship, c. 950-1204. He has previously published on topics including the use of exaggerated and fantastical genealogies in medieval Byzantium, the role of Emperor Leo VI’s homilies in his political program, and Byzantine canon law. His current research explores kinship and family life among slaves and freedmen in Byzantium between the sixth and twelfth centuries. Prior to his current position as an Andrew W. Mellon Postdoctoral Fellow at the Byzantine Studies Research Center of Boğaziçi University, Dr. Leidholm has received grants to support his research at the Dumbarton Oaks Research Library in Washington, DC, Koç University’s Research Center for Anatolian Civilizations in Istanbul, and the Institute of Historical Research in London.